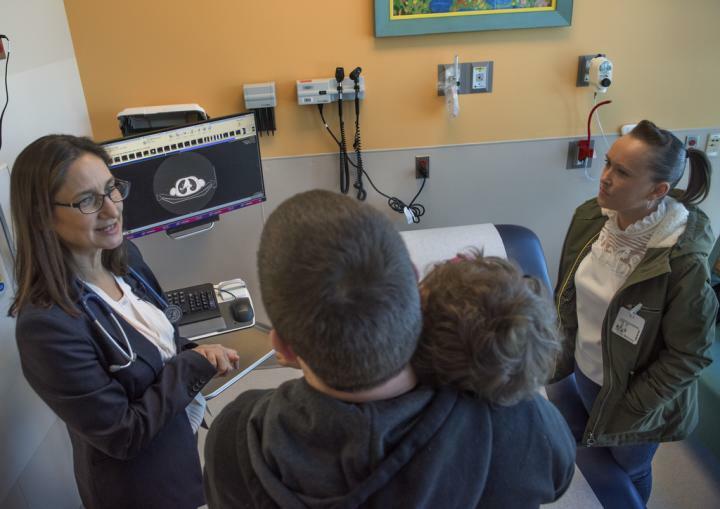 "These results are promising and have changed the outlook for our patients with high risk neuroblastoma," said Giselle Sholler, MD, director of pediatric oncology research at Spectrum Health Helen DeVos Children's Hospital and principal investigator of the study. "By using DFMO for two years after finishing conventional therapy, we've seen an overall two-year survival rate for these children of 97 percent. This is a large increase in survival," Sholler added. "Previously it was believed that children with refractory and relapsed neuroblastoma were considered incurable. This study shows more than 50 percent of patients remaining in remission up to four years." Beat Childhood Cancer's trial studied the use of difluoromethylornithine (DFMO) as a single agent for enrolled patients at 20 children's hospitals from June 2012 to February 2016. The children received two years of oral DFMO twice daily and were evaluated for outcomes of event free survival (EFS*) and overall survival (OS). The study used targeted oral therapy of an ODC inhibitor (DFMO), as a maintenance therapy to prevent relapse in HRNB patients after standard therapy. DFMO works by targeting specific cancer stem cell pathways and "turning off" the cells, thereby preventing the cancer from growing back. "While these EFS and OS figures at two years are remarkable, the really exciting part of these results is that EFS and OS are stable out to four years," said Patrick Lacey of Beat NB Cancer Foundation, one of the childhood cancer parent-led foundations that funded this clinical trial. "Not only did this oral drug lead to a prolonged and stable remission for the children in this study, but the drug was extremely safe and well tolerated in this patient population." "While many children have been able to attain remission with the current, albeit harsh, upfront therapies, these remissions are not historically durable," Dr. Sholler added. "The current five-year survival curves have not changed significantly in the past two decades despite recent increases in two-year survival as a result of intensified therapies and new multimodal therapies." Principal Investigator at MUSC, Jaqueline Kraveka, MD, states survival for children with high-risk neuroblastoma remains a challenge. "These results are groundbreaking and very exciting for oncologists and their patient families. I am thrilled to have our confirmatory study open at so many sites across the USA and Canada, enabling children to receive this treatment close to home." Hospitals participating in this study included Spectrum Health Helen DeVos Children's Hospital, Cardinal Glennon Children's Medical Center, Medical University of South Carolina, Arkansas Children's Hospital, Arnold Palmer Hospital for Children, Penn State Milton S. Hershey Medical Center and Children's Hospital, Rady Children's Hospital San Diego, Kapiolani Medical Center for Women and Children, Levine Children's Hospital, Connecticut Children's Medical Center, Phoenix Children's Hospital, Children's Hospitals and Clinics of Minnesota, Medical University of South Carolina. Beat Childhood Cancer's DFMO trials are currently open at 40 hospitals in the U.S. and three hospitals in Canada. Spectrum Health is a not-for-profit health system, based in West Michigan, offering a full continuum of care through the Spectrum Health Hospital Group, which is comprised of 12 hospitals, including Helen DeVos Children's Hospital; 180 ambulatory and service sites; 3,600 physicians and advanced practice providers; and Priority Health, a health plan that served one million members in fiscal year 2018. Spectrum Health is West Michigan's largest employer, with 26,000 employees. The organization provided $434 million in community benefit during its 2018 fiscal year. Spectrum Health has earned recognition as one of the nation's 15 Top Health Systems six times by Truven Health Analytics®, part of IBM Watson HealthTM.